During the 1800’s, love and marriage were very different than they are today, especially for members of the upper class. Courtship was almost like a business arrangement, and people often had to get their parent’s permission before they could be in a relationship. In modern times, we read a lot of romance novels from the 1800’s about two lovebirds riding on a horse off into the sunset, or a passionate speech convincing a parent that love should matter more than status. In reality, though, this almost never happened. 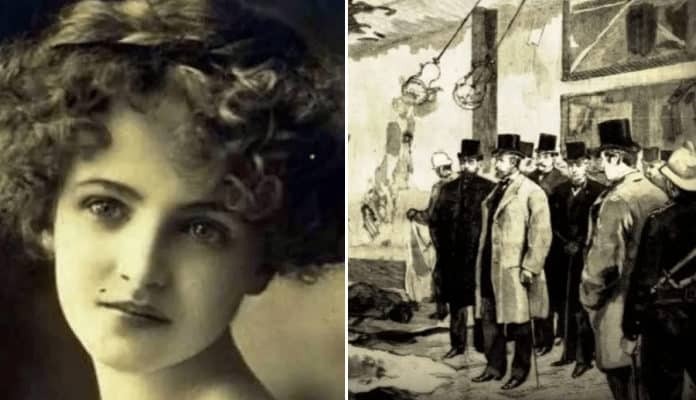 And when it did, there were dire consequences, and Blanche Monnier is just one example of how a secret affair could go terribly wrong. The year is 1876. Poitier is a wealthy town in Western France, and the Monnier family lived in a mansion on 21 Rue de la Visitation. Madame Louise Monnier’s husband, Emilie Monnier, passed away. He had been the director of an arts faculty in town, and he had accumulated a fortune, so after he died, it was enough for Madame Monnier and their children to live on. Their daughter was named Blanche, and she was very popular in town. She was a happy, bubbly and beautiful girl with huge eyes and thick brown hair. Her brother Marcel became a lawyer, and they both lived together with their mother into their 20’s. Blanche’s mother, Madame Monnier, was a perfect example of someone who only did nice things to appear to be a good person. She got an award from the Committee of Good Works for all of her charity projects around the city, and yet she was a monster in her own home. Marcel and Blanche had a very difficult time finding someone who wanted to date them, because their mother was incredibly snobby, and had high expectations about who her children should be allowed to marry. At age 25, Blanche was getting close to “old maid” status (by the standards in the 1800’s) and she knew that she had better hurry find a husband and move out of the home before it was too late. She met a lawyer who was slightly older than her, and she completely fell in love with him. He wasn’t rich or successful, but Blanche loved him as a person, and they became inseparable. Blanche kept their relationship a secret from her mother, because she knew she would disapprove. Nearly every night, she waited for her mother and brother to go to sleep, and she would quietly sneak down the stairs to see her lover after dark. At that time, the term scandalous didn’t even touch the situation. In the 1800’s, love had very little to do with marriage, and parents were heavily involved with who their child courted. This was especially true for members of the aristocracy, like the Monnier family. Usually, dates were supervised, and both families would meet one another and come to an agreement that they meshed well together. A marriage was a team effort, more than two people would decided who fell in love and if it’s a well-suited match. Romance novels reached peak popularity at the time, and Blanche’s reputation for being a bibliophile preceded her. It’s very possible these fictional couples fighting for love against all odds inspired her. She clearly disagreed with the expectations society expected of her. Even though Blanche tried to keep her relationship a secret from her mother, there were plenty of witnesses around town who saw her with her boyfriend, and yet no announcement of an engagement. They also steered clear of one another in the day time, making it obvious for anyone paying attention that this was a secret affair. The townspeople could not understand why they would keep their relationship a secret, so they started a rumor that Blanche must be pregnant. When her mom found out about the secret relationship, she was absolutely furious. Madame Monnier forbade Blanche from seeing her boyfriend ever again. The two would get into huge arguments, and Blanche would sneak out to see him anyway. Surely, she had hoped that he would propose to her, and that she could escape her mother’s house soon enough, anyway. She could have never imagined what would happen to her next.